New and old meet: The images below were taken with a modern Pentax K-5 DSLR and a vintage Tamron Adaptall-2 system SP 350mm f/5.6 catadioptric mirror lens (Model 06B). 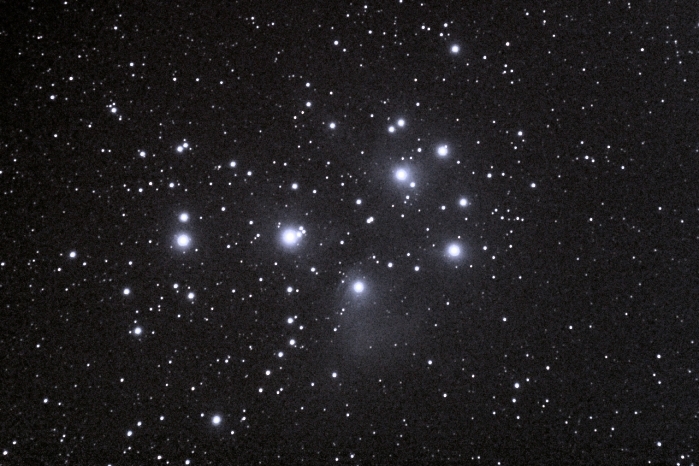 All exposure times were 15s throughout the series below and tracking was achieved using the Pentax GPS Unit O-GPS-1 and its Astrotracer function. It is testimony of modern DSLR technology and the purity of Tamron's adaptall-2 lenses that it is at all possible to capture even quire faint objects under a city sky. But enhancing these without increasing noise by an equal amount is a demanding task with the fainter objects. More so, because city sky glow is a ghastly mix of spectral lines from all sorts of incandecent and flourescent lamps and posters, that are all but impossible to filter out in the postprocessing. 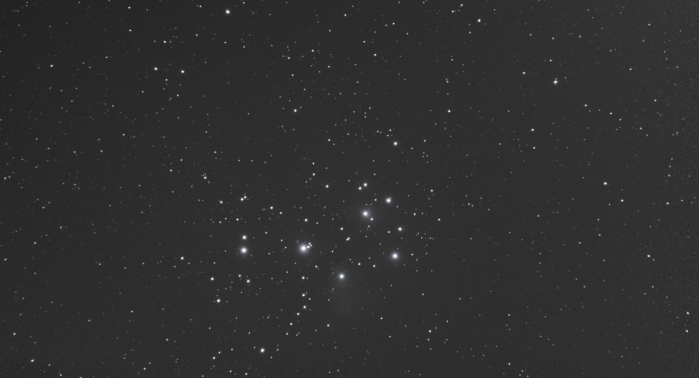 So, forget about Hubble Space Telescope images and join me in my more huble quest - just to get a glimpse of some of these small celestial gems. 2. 5 exposures at ISO 1600, 10 at ISO 3200 and 10 at ISO 6400 stacked in Deep Sky Stacker. We are indeed getting a glimpse of the reflection nebulae. 3. Image 2 above contrast enhanced in PhotoImpact. Yes, there is some noise but still a small victory for me to bring forward this faint light on a so-so night (between 22 and 23 November 2012) - even with the half Moon in the sky. 4. 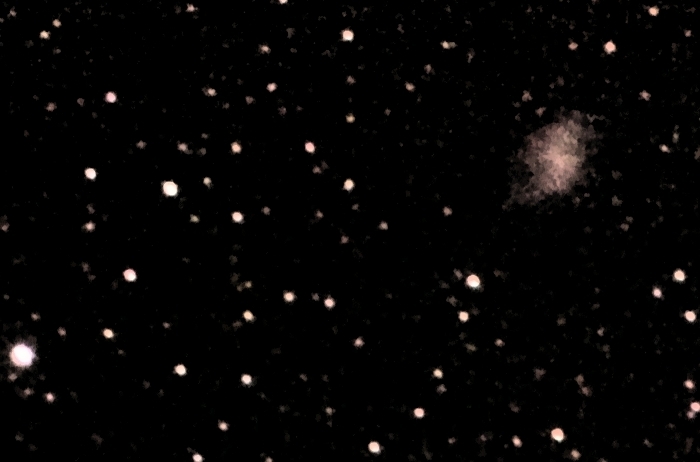 Another faint object in Taurus: The Crab Nebula, Messier 1. With a surface brightness of around m = 10, this is also one, that I cannot expect to capture on each and evry night. 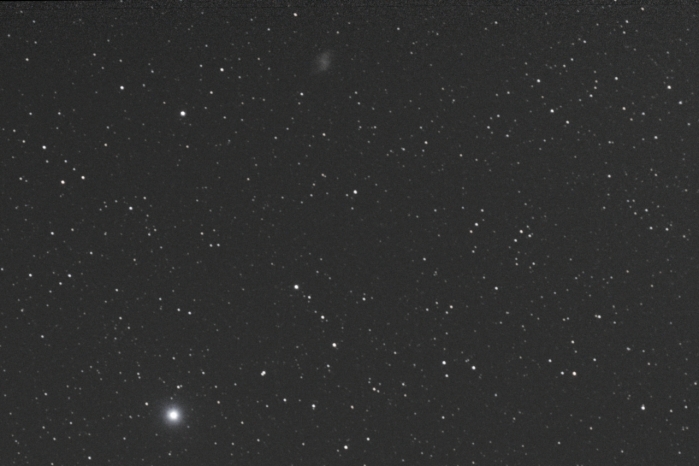 But it is readily visible in this mosaic stack in Deep Sky Stacker of 10 exposures of 15 seconds at ISO 3200 and f/5.6. 5. This is simply a tighter crop of Image 4 above. The elongated shape (11 light years long seen at a distance of some 6.000 light years) is evident. 6. 100% crop of Image 4 above post-processed in PhtoImpact. 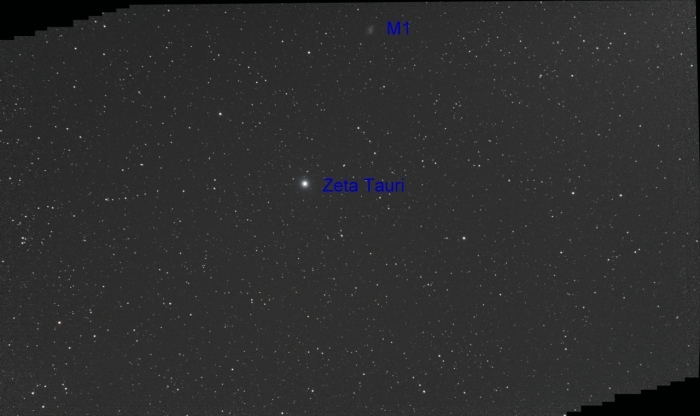 The surface brightness of M1 is fairly high an thus, some more agressive contast enhancement and noise reduction was possible. This resutl certainly gives me the desire to try out my equipment on this target under a better sky. So, does it make sense to chase these elusive smudges of light under a light polluted sky? The answer lies in the eyes of the beholder, but for me it is a thrill to capture them and have my very own, humble collection of images of the dee-sky wonders.